Is the saying “The third time is the charm” correct? The minute you start to play Governor of Poker 3, the answer reveals itself to be an affirmative “yes”. This third release improves upon the previous two versions while retaining all the charming aspects that made the original duo so enjoyable to play. The Governor of Poker 3 is a new member of the world of Texas Hold’em poker apps. Texas Hold’em poker is extremely popular and ranks very high on the list of all gambling-oriented games. This particular one is strictly for free play, but it is still highly engaging and enjoyable. Anyone who really loves Texas Hold’em poker should give this game a try. Likely, someone who is a huge fan of Texas Hold’em probably knows a little bit about what to expect and the expectation is going to be an extremely fun game. The designers of the third version deliver on this expectation. Actually, they have improved on the few complaints that exist in a new update. The update resolves crashes that were previously reported by players. The game is experience is reported as being very realistic and that is a nice trait to have in the world of virtual games. Certain poker games just lack the realism that should bring out the true feeling of playing at a table. This multi-player game does infuse a nice amount of realism and all the players will appreciate the suspension of disbelief the virtual game delivers. The fantastic design of the platform really is what adds to the realism and the enjoyment level of the game. A lot of work went into crafting this game and it shows in the wonderful colors and graphics. Seven brilliant variants are available with the game and these variants include multi-table tournaments, turbo cash, and heads-up. The game never gets boring this way. This is not to say the game is going to bore anyone easily. When you begin the game, you start out at rookie level and have to keep winning and winning in order to reach VIP level. The journey is sure to be a fun one. 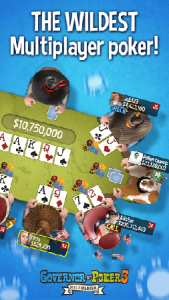 Even if you never played the previous releases, Governor of Poker is still worth downloading. The experience is bound to be fun and this release adds greatly to the legacy of Texas Hold’em.